The America’s Cup World Series resumes this week, as the foiling AC45s descend upon Gothenburg, Sweden for the Louis Vuitton America’s Cup World Series, with racing this weekend, 29-30 August. “The Louis Vuitton America’s Cup World Series Gothenburg is an opportunity for the teams to put more points on the board that will count towards the penultimate racing in Bermuda in 2017,” said Russell Coutts, the CEO of the America’s Cup Event Authority. “In the first event last month in Portsmouth, Ben Ainslie was clearly better than the rest and deserved to win. 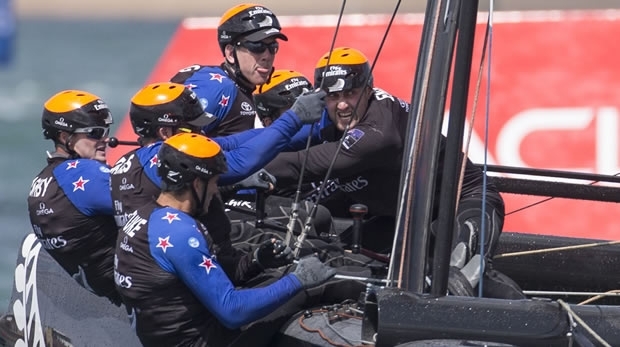 Peter Burling was also very impressive in his first start for Emirates Team New Zealand,” continued Coutts. “However, I’m sure the others will be looking to improve, none more so than Artemis which has a boat stacked with Olympic champions. They definitely have the talent and they will certainly want to put on a better performance in front of their home crowd in Gothenburg." Sweden boasts a centuries old tradition of sailing and first challenged for the America’s Cup in 1977. Today, some of the world’s finest professional sailors hail from the country, including local hero Olympic champion Freddy Lööf, a critical crew member of the America’s Cup Swedish syndicate ARTEMIS RACING, the hometown favorite heading into Gothenburg. Artemis Racing has a multinational crew comprising some of the most successful and respected sailors and designers in the world. Collectively, the sailing team has competed in 23 Olympics Games, winning 11 medals, 7 gold. Artemis Racing represents Kungliga Svenska Segel Sällskapet (KSSS – the Royal Swedish Yacht Club), the fifth-oldest yacht club in the world. The hub of the Louis Vuitton America’s Cup World Series will be the 50,000 square meter Race Village in Frihamnen, in the heart of Gothenburg. Visitors can enter the area for free and enjoy activities, concerts and entertainment during the entire event. August 27th is the designated Tech Day when the AC45F’s are launched and the teams prepare for racing. Then Friday, August 28th marks the official Training Day at the Race Arena in Långedrag. Practice racing takes place during this time. Spectators can follow the racing up close from the shoreline surrounding the Race Arena in Långedrag, from spectator boats on water or on wide screens in the Race Village. Additionally, Oscar II Fort, a facility overlooking the racecourse, will be opened up for visitors for a charge of 50 Krona during the races. To make it easier for fans to tune in on-the-go, wherever they may be in the world, America’s Cup has launched the new America’s Cup App, available for Android and iOS mobile devices via Google Play and the Apple iTunes store. (NB The app is not optimised for PCs) The app is free to download and has news, photos and race results. The America’s Cup App also offers enhanced online coverage through the premium AC+ feature. AC+ will feature live streaming coverage of the races (subject to territorial restrictions) as well as an enhanced ‘second screen’ experience featuring on board cameras, video extras, social chat features and behind-the-scenes storytelling. AC+ is a paid service, available for US$7.99 for the Louis Vuitton America's Cup World Series Gothenburg. For America’s Cup fans around the world, there are a number of different ways to follow the high-octane racing in Gothenburg. Many of the international television broadcast rights holders will show live racing Saturday and Sunday, others will have the highlight show. Networks like BT Sport (UK), Canal+ (FRA), CCTV5+ (CHN) and FOX Sports (AUS) are among those to show live racing. NBC/NBCSN in the US will show highlights. Also “second screen” experience available live for mobile devices on the AC App (no live race feed). Additional broadcast on NBC regional affiliate channels to be confirmed. Live for both days on Canal+ Décalé: 1100 – 1230 GMT. SPORT TV will broadcast both races live.